In fresco painting it is necessary to have a well-thought-out design prepared before hand, as the medium does not permit experimentation or changes in drawing as is possible in most other ways of painting. If the plaster dries before it is completed, or if you have made a serious error, start over again with a new coata little bit of plastering experience will convince you that it is wiser to do the best you can with the piece before youas plastering is really the only hard part of fresco painting. Light, space, air and architecture are all determining factors in how the fresco shall be painted. The carrying power of the painting must be experienced in the actual setting, and it usually takes one patch, or less, to serve as the guinea pig in establishing the right key. This is one reason why a fresco painted directly on the wall, where it will always be seen, has a better chance for being right than does a mural painted on canvas in the artist's studio, and later glued to the wall. 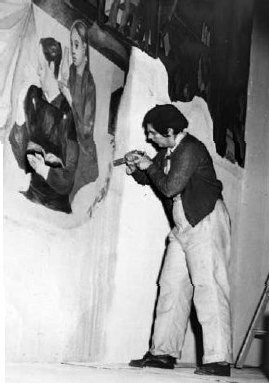 On a large fresco toward the beginning of the work it is sometimes difficult to key the color. The first sections are so high and isolated that there is nothing to which to key the color, value and intensity. It usually takes one patch, or less, to serve as the guinea pig in establishing the right key. In addition as the work progresses the fresh new plaster is darker than other previous (and dry) patches next to it; it takes experience to trust that each daily section will match the previously completed ones. Just before transferring your design, smooth uneven places on the plaster with ball of hand covered with tracing paper. 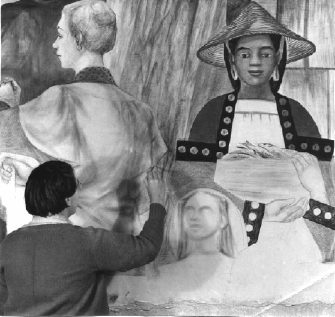 Traditionally, the drawing is transferred to the plaster by means of a perforated cartoon, through which is sifted powdered paint or charcoal dust. I used this method in all of my murals and to create the perforations in the cartoon, I used a dressmaker's wheel. Today, there are more options to choose from when transferring your design to the wall; overhead projectors or slide projectors work well and are quite acceptable. 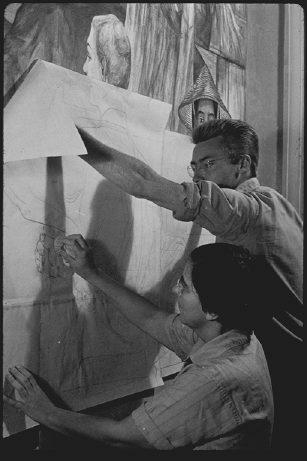 Orozco used this method, instead of the cartoon. Actually, although I did not have an opportunity to try these methods, I believe that in terms of the longevity of the painting, using a modern method may be preferable. If using a cartoon begin when the plaster coat no longer gives to the index finger trace. Press in contours of cartoon with brush handle or pounce. Another way to judge the readiness of wet plaster is that it can bear the pressure of the pounce pad, which is made from a bag of cheesecloth filled with charcoal dust. Sometimes I needed help to hold the paper pattern in place as I dusted the charcoal thorough the tiny holes in the paper formed by running a dressmaker's tracing wheel along the drawing lines. The most meager amount of line that the artist can get along with is used, for the artist wants to be free to improvise on this line, and too many guidelines now would limit one. When working on a fresco in a public site, when the plasterer is through and has gone home for the day, you are left with a few hours of quiet bliss before the offices open and the continuous line of public comes and goes below or even through your site. Be prepared to take advantage of this time. While the plasterer is doing his work early in the morning, grind the minerals for making the paints. If in grinding color it takes water poorly, add a little alcohol. Put a small amount of lime into those that will be used during the first part of the day. One of the most stimulating things about fresco painting is that the plaster has a life of its own, with its own needs and appetite for water, paint, and various brush pressures. I have identified at least four stages in the life of the plaster. The first period will last 6 or 8 hours (at northern latitudes) during which time the color areas are put in, using a semi-dry brush. Here a small pinch of lime whitethe lime itselfis mixed with each color in order to give it the body that is used for the modeling. This particular mixture is called verdaccio, and was used by the great Italian painters. It is not used today very commonly, but I discovered that it is the means of giving great strength to the drawing and the modeling. To brush on this mixture takes great physical strength, like pounding forte on the piano for hours, and this may be one of the reasons that Diego Riviera does not use it. Modeling and drawing are now done very loosely with a coarse, small, almost dry brush. Beating the paint into the plaster without disturbing the surface of the plaster. Don't be afraid of running over outline with local color. Color must be liquid, but must not run down in drops. Don't disturb ground with brush or whitish patches will develop. Don't torment the color. Following the period when one paints in the verdaccio, there comes a second plaster response quality when dozens of coats of clear colors are laid on the area with a small brush, building up the local color area. This building up of color goes on hour after hour of fine clean brush strokes played one against another, and then one on top of anothera hundred strokes to the minute, I was told by a man with a stopwatch who had timed me one day. In the evening there comes a third surface quality when the plaster is so thirsty that it drinks up every brushstroke, and literally quarts of thin watery paint is fed onto the plaster with small watercolor brushes. This forms that beautiful fine polished marble-like surface which is peculiar to the well painted fresco. While earlier in the day the plaster almost rejects the paint, now it is the most joyful kind of cooperation, of action, between the plaster and the painter. I know of no such response in any other creative mediumit is as if the painting had been born for this short period of time for it responds with its glorious luminous surface and it accepts each caressing brushstroke. Were it not for this hour or so of rewarding painting, I am very sure that the already very weary artist would have gone home hours before. Also, I am very sure that not all fresco artists have discovered this golden hour. Late in the day toward midnight we come to a short valuable period when the plaster develops a ravenous appetite and seems to pull the paint from the brush. This is the time we work to clinch the solidity of the brushwork. If ground begins to pull, or whitish dry spots appear, or if color becomes so thick, stop painting that area. Add sugar water and thinned milk as an anecdote for lime in lime. Then, about midnight, the plaster says, "sorry, no more." If you try to force it to take more paint and water, it actually almost spits it back at you. The day's painting is over whether or not you feel the work is right. Twenty or more hours of the maintaining of constant recollection is behind you, and all of you aches with weariness; yet all of you is joyful over having been given another fresco day. The day's painting is then over22 hours at a northern latitude, further south 12 or 14 or 16 hours before crystallization begins to set it. Sometime before, nearer the middle of the day, the leftover edge was carefully trimmed away. Any unpainted or unfinished part are now trimmed out down to the plaster coat underneath to await another day similar to this one. Since it was my technique to lay each piece of plaster larger than I intended to paint so that the surrounding areas held the moisture longer, the trimming process in my work took a little longer than usual. Finally tomorrow's section is marked off on the wall and is given a good soaking with water. Each day the drama is re-enactedpiece by piece, day by day, as the painting grows toward completion. The day's stretch of twenty hours of hard physical labor, of constant creative awareness, is overand more twenty hour days, are just ahead. How can one continue to paint these twenty hour stretches? I have found I can do it by working on a 48-hour day. But this sounds even worseperhaps I will have to tell you how it is done. This strange day begins about noon, when I get up and go to the jobcleaning up brushes and paints from the day before, and getting all in readiness for the painting session. This takes until dinnertime, followed by an early bedtime. 3:30 in the morning comes early and at 4 the plasterer and myself are on the job, beginning this 20 hour stretch. Meals are eaten on the scaffold. I have often wondered who took Michelangelo his mealsup there so high on the scaffold in the Sistine Chapel; it wouldn't have been so bad for Fra Angelicohe had a corps of Brothers to wait on him, but Michelangelo worked alone. After the paintings dry it is absolutely permanent; the paint penetrates the surface of the plaster, is incorporated with it, and the two dry together, the crystalline surface of the plaster forms like a glass on the color and fixes it for all time. Its beauty increases with age, and given proper protection can easily last 1,000 yearsas long as the wall lasts. If removed to a new wall its life can go on and on. Sometimes atmospheric conditions peculiar to a certain day affect the life of the plaster; sometimes the painter isn't up to par, or hasn't made adequate preparations; perhaps curious visitors come at the wrong moment; many things may happen, and it always seems a miracle if nothing outside oneself happens which might forbid the painting from coming through right. In any event, knowing how to lay the intonaco layer is an important part of your skills because you may find that you must chisel out a section and do it over again. Do not start touch ups before 4 weeks, give fresco that long to dry. Use casein, apply by means of hatching. Try Wax ammoniamix thick, like soft cheese with very little watermix with powdered color by rubbing two together with an old round brush and stiple on. Use zinc white for white. To remove whitewash over a paintinghammer covered with leather, or a wooden hammergo carefully only for a short time in a given area. Spatula like instruments also help to lift off limewash coat of strong casein, which also helps to lift off limewash.